Monday morning felt calm. Perhaps it was because the sun was shining again after a week of rain and the wind was finally silent. Sparrows chirped quietly in the trees happy for the warmth of the sun, but still sleepy from the long cool night. Maybe it was because I didn’t need to take my daughter to school for the next week(winter break) and I was able to sleep in a tiny bit longer. Calm was needed. The last month has been turbulent. We were blessed and challenged greatly in this short month. The serenity of the morning seemed to be a little gift from the universe and so I made a cup of tea and headed to the patio. I sat, wrapped in a light blanket, in the warm morning sun, sipping my tea for what seemed like an hour. It didn’t take long before my mind wandered to food. Specifically comfort food. What could I whip up to make this day even better? What is my most favorite comforting indulgence? My first thought was ice cream. I love ice cream more than any other food. But I was really in the mood for warm. Something like cookies. 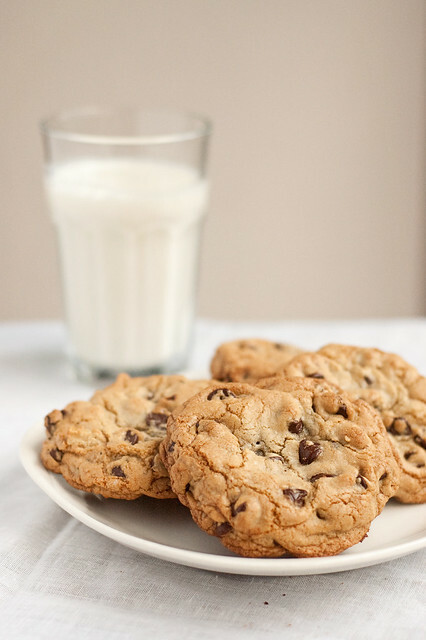 My favorite, everyone’s favorite, giant chewy chocolate chip cookies. 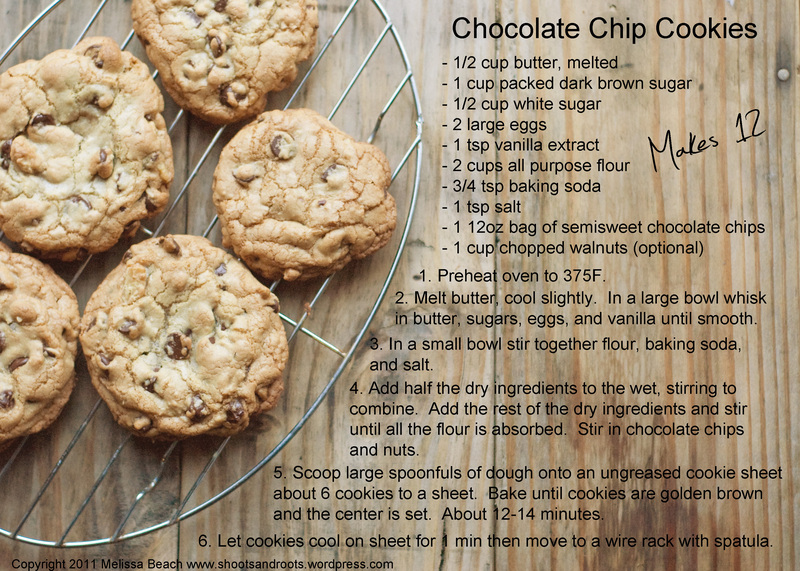 The recipe originates from Alton Brown’s Chocolate Chip Cookie #10 from his I’m Just Here for More Food Cookbook. After making his recipe a few times I began to change a couple of things. His recipe used 1 cup of butter, I used 1/2 cup. He uses 3/4 cup of each sugar and I use a little more brown sugar then white. Things like that. My version is less greasy and has a richer flavor from the brown sugar. They are chewy and stay soft for days if kept in a zip top bag. I love them, everyone I give them to loves them, and I know you will love them. I made you another printable recipe card which you can find at the very end of this post. 1. Preheat oven to 375F. In a small bowl whisk together the flour, baking soda and salt. In a larger bowl whisk the butter, sugar, eggs and vanilla together. 2. 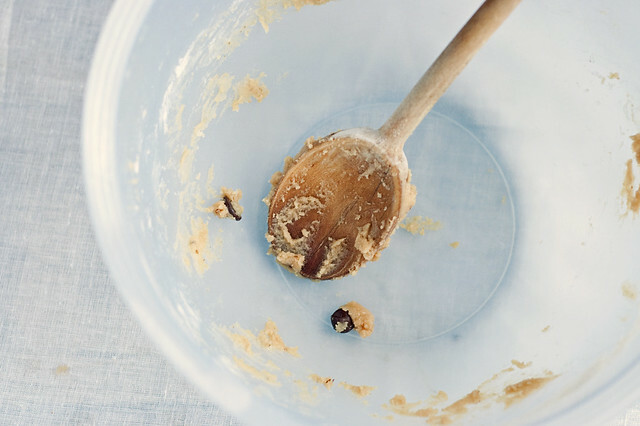 With a wooden spoon stir half the dry ingredients into the wet ingredients and stir until combined. Add the rest of the dry ingredients to the wet and stir until all the flour is absorbed. Stir in the chocolate chips and nuts. 3. 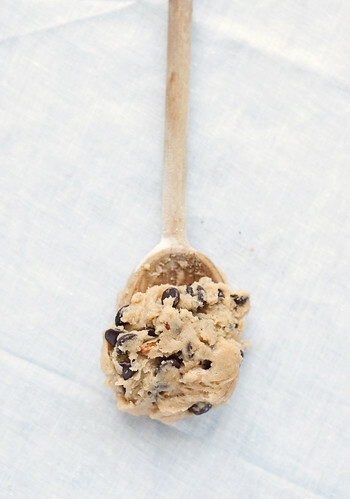 Scoop large spoonfuls of dough onto an ungreased cookie sheet. About 6 cookies to a sheet. 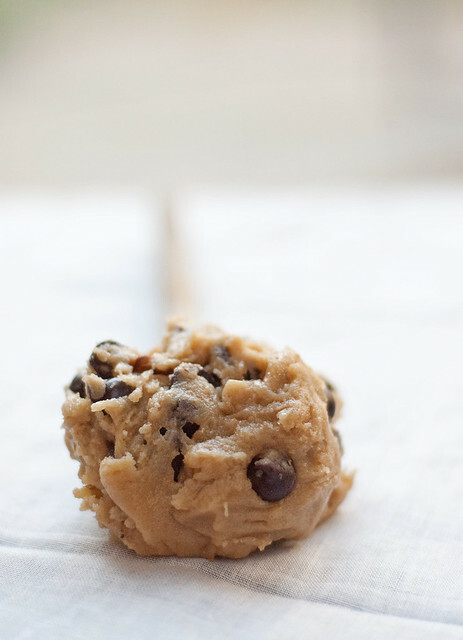 Bake for 12-14 minutes or until cookies are golden brown and the center is set. Let them cool on the pan for a minute then transfer to a wire rack. These look amazing! Thick and chewy just like I like ’em. Since the butter is being melted anyway, I wonder if these would be even better with browned butter. Irresistible either way! That is a great idea! I am going to try it next time. Thanks! These look amazing, and much better than my efforts at the weekend. I have a bad habit when making chocolate chip cookies of serving my friends plates of warm dough. I think I get so anxious about making sure they’re chewy, as I know they carry on setting when you take them out of the oven, that I can never judge it right (I did 2 batches on Saturday and the second one was a tad too crispy). 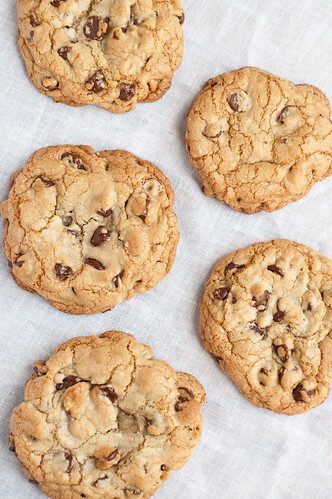 Do you take your cookies out of the oven a couple of minutes before they’re due out, hold them in the cool air for a minute, then pop them back in for a couple of minutes? I’ve seen friends go through this mysterious ritual and so I tend to do it too. Not sure what it actually does though, are you? Have you ever made cookies a bit too squidgy? If so how did you combat the problem? Help! Jenny- While I was making this batch my second tray was slightly undercooked and the cookies started to fall though my wire rack, so yes this happens to me too! Usually they just need another minute (literally 1 min) in the oven. I usually set the timer for 12 minutes then check the cookies every minute after that until the center is just set. Sometimes they need 13 minutes, sometimes 14. It depends on how big they are. Then I take them out to check again. If they look good I let them sit on the cookie sheet for at least a minute to firm up before moving them to a tray with a spatula. If you make sure the centers are set and the cookie is light brown all the way to the center then they should be fine. Hope that helps! I love a GIANT chocolate chip cookie any day. Very nice. I am going to need a bigger glass of milk. These look so incredible! Oh, what I would do for one of those right now! Bookmarked! I hate when that happens. I have a hard time not eating all of the batter. My chocolate chip cookie recipe is supposed to make 24 cookies, but I’m lucky if I can get 10 baked. These cookies look really, really good. I like your photographs too. I love the way you photograph food. Really so stunning. It makes me happy reading your blog. Ended up in your blog after receiving your mail in the bay area food blogger group. Nice to have known you. You have a lovely space, enjoyed browsing through your posts. There is a SFO bake sale coming in May (I am sure you would have seen that mail). I am planning to participate as well. May be as you said we will get to meet some of bay area food bloggers in the upcoming months. See you soon! Stay in touch. Thick and chewy is definitely how I like my chocolate chip cookies. And your photography is gorgeous!! Love this recipe! I made them earlier tonight and they’re heavenly. The salt content is unusual, I don’t often see that ratio of salt in a single batch of cookies, but it really brings out the flavor of the chocolate. i love your photographs! i can practically taste those cookies! I just made these and they are AMAZING! They came out perfectly chewy and great in size. I made exactly 12. I’m so happy to find a recipe that doesn’t require you to refrigerate the dough and still comes out big and chewy instead of flat. Yayy! To this day those are my favorite cookies. Glad you love them! 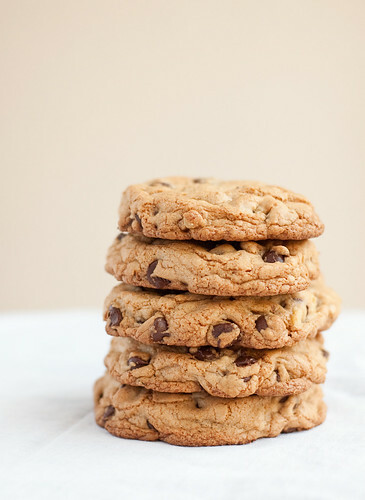 Pingback: GIANT CHOCOLATE CHIP COOKIES | Nutella Is Ma Fella!